Widgery Cross was erected on Bray Tor (also known as Brat Tor and Widgery Tor) by William Widgery to commemorate the Golden Jubilee of Queen Victoria in 1887. 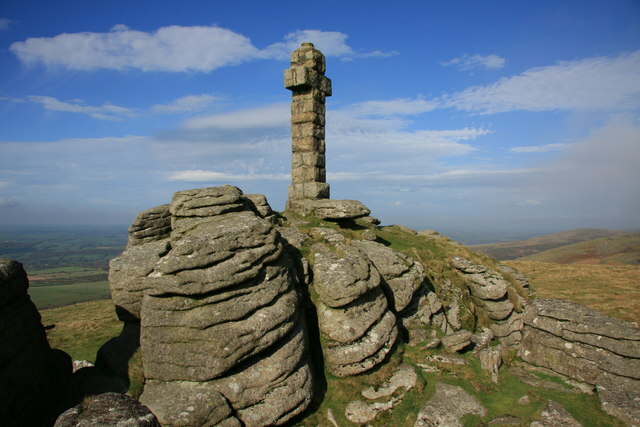 It is made from 10 courses of granite blocks and is the tallest cross on Dartmoor. The cross is almost 12ft 8 inches (3.86 metres) in height and has a span of 4ft 4 inches (1.32 metres), the words “W. Widgery, Fecit, Jubilee VR” are inscribed on the eastern side of the base stone. The cross is orientated on a east – west alignment. There is a free car park not far from the base of the Tor which can be reached by turning up a track which runs alongside the Dartmoor Inn on the A386. It is approximately a 40 minute walk to the top and very well worth the effort to see the wonderful views.